Redcap Goblins are small green-skinned gnomish creatures not unlike Kobolds that spawn beneath the surface of the Twilight Forest. They can be found most often inside Hollow Hills and Twilight Forest Caves, but are not relegated to them. 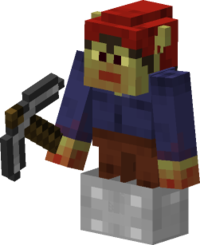 They are similar to the Redcap Sapper, but are weaker in both health and the amount of damage that they can do. While the Redcap Sapper deals an identical amount of damage to the Redcap Goblin, the Redcap Sapper also has the capability to place primed TNT entities on the ground, potentially damaging the player and the player's surroundings. Redcap Goblins are creatures which attempt to be stealthy by circling around a player and attacking the player from behind. If a Redcap is directly attacked by the player, they will respond to the attack with a direct attack themselves. Redcap Goblins tend to circle quite close to the player, meaning that they often do not succeed in their attempts to surprise the player. Their capacity for surprise and stealth is also diminished by their constant laughing sound that they produce invariably. This sound is constant and only stops when the Redcap is being attacked, in which case it produces a short high-pitched shrieking sound. Redcap Goblins have a good chance of appearing in Hollow Hills. Their giggling makes it easy to differentiate between a Hollow Hill and a regular hill or a Highlands biome. In addition, Redcap Goblins also drop Coal and have a chance to drop one or more of an Iron Pickaxe, a set of Iron Boots or a Maze Map Focus. This makes Redcaps a helpful mob in terms of navigation for finding caves and hollow hills as well as a mob that can be farmed for its drops, and due to their easy-to-defeat nature (dealing only one heart of damage each hit and requiring just as much damage as a Zombie would) they can often be more helpful than harmful to the player. Although Redcap Goblins have 10 hearts of health, due to their Iron Boots which provide a minor amount of protection, they can actually take 22 hits by the player's fist before dying. Without armor, Redcap Goblins would only take 20 hits. A similar attribute is shared by the Redcap Sapper. This page was last modified on 17 April 2019, at 06:16.